Below is the second set of photos in the continuation of what appears to be a historic rehabilitation event in sea turtle history. 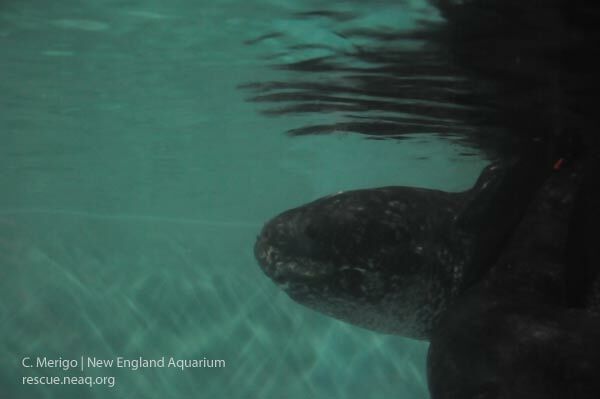 As far as I can find, no other leatherback sea turtle anywhere in the world has been rehabilitated and released with a satellite transmitter to document the turtle's re-entry into it's natural environment and it's survival. I hope my sea turtle colleagues will correct me if I am wrong! This blog continues where I left off in the last installment. 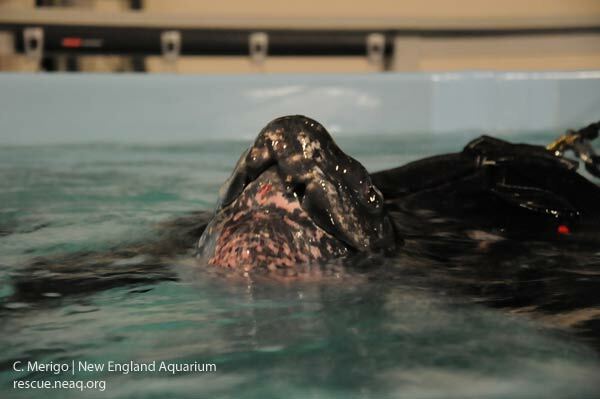 In case you didn't read the first blog, I wrote about the stranding, transport and initial care of this giant turtle. Below I pick up the story from the point of first entering the turtle in the water. 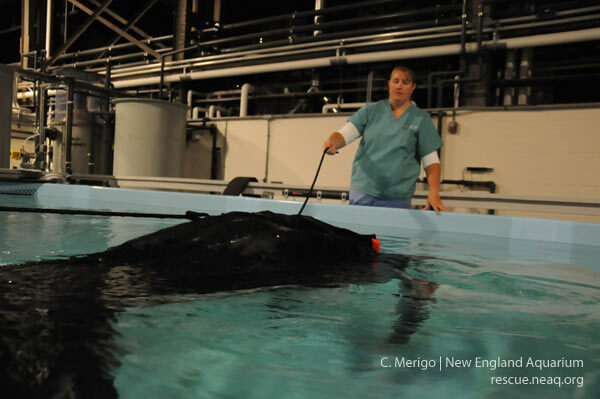 In the photo below, Dr. Cavin holds a line that is attached to a harness that is attached to a harness around the shoulders of the giant leatherback turtle. You can also see another line on the harness heading across the left side of the photo just above the water. This harness acts, in a sense, like a leash on a dog. 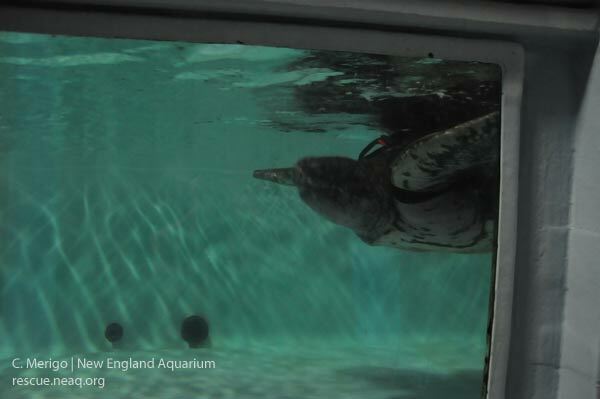 It prevents the turtle from contacting the walls of the tank. Based on the blood chemistry and profile, medication and fluids were prescribed by Dr. Innis or Dr. Cavin to correct abnormal blood results. 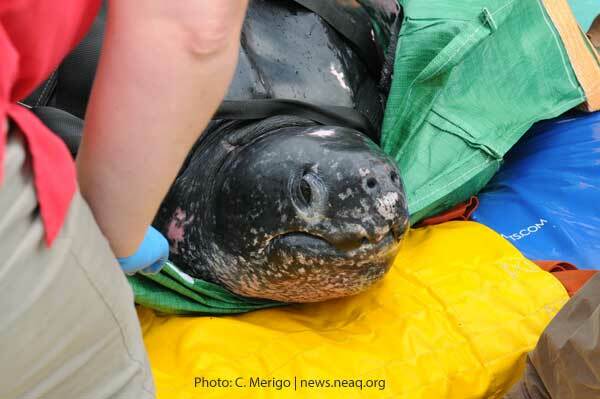 The turtle became more active over time as these medications/corrective measures began to take effect. In the photo below the turtle is in motion, swimming underwater. 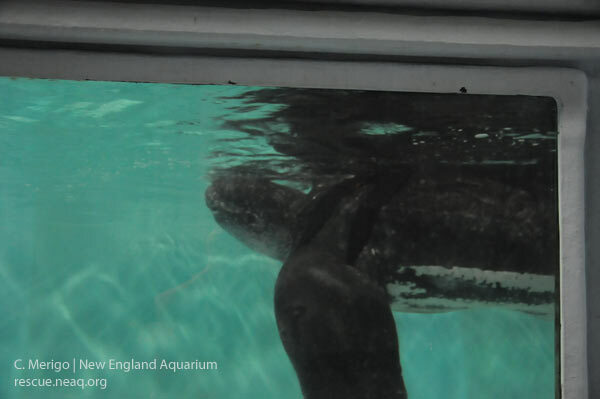 You can see the black strap of the harness under the front left flipper of the turtle. The turtle lifting his head out of the water for a breath. Both harness straps can be seen in this photo. The turtle as he rests below the surface of the water. Even at 655 pounds, this turtle was not at full weight for his mature status and length. A trained eye in sea turtle health may notice the areas around the turtle's neck and shoulder area are thin in this photo. The photo below was taken as the turtle swam toward me and lifted his head for a big breath. Plenty more photos and exciting parts of this story to tell folks. In the next blog I'll begin explaining how we removed this giant turtle from the tank and transported him for release back into the big blue. Also to come are maps of his travels...history in the making my friends! Stay tuned. Fantastic work, folks! Leatherbacks swim continuously and need that harness. Thanks for saving this magnificent turtle! 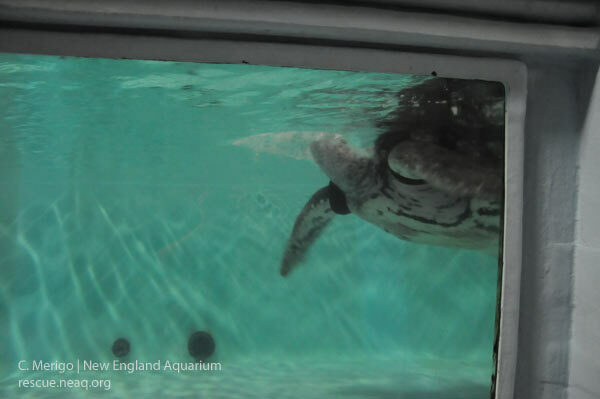 Our green sea turtle Myrtle was definitely excited about this historic rescue, too. She wishes the leatherback well on his journey. fantantic story. i'm a teacher and plan to use this story as supplementary lit to the rescue of a kemp's ridley in our 6th grade course book.